To think that it has been nearly a year since I read any Banks last – not strange that I had to consume this one over a single weekend. Sometimes a book is just so good, that it becomes hard to review properly, without reverting to long sentences overflowing with superlatives (which quickly becomes boring). I know that I've used this excuse before, but that doesn't make it less true. 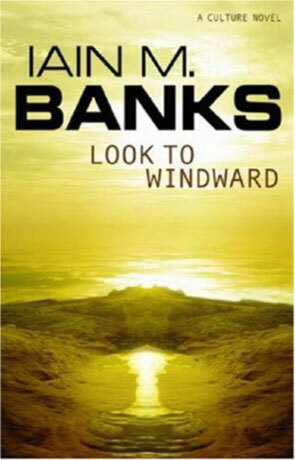 So let me sum up Look to Windward in one sentence: Look to Windward is the ultimate Culture novel. It can't get any shorter than that and still hold meaning or any degree of accuracy. And it is accurate, because Look to Windward tells us as much about the Culture as it is possible to tell in three hundred and fifty pages while still keeping a story flowing. And in that sense it is the ultimate Culture novel as it tells us as much about the Culture as possible. It may not be the most exciting Culture novel (that will probably be Use of Weapons) or the funniest (that would be Against A Dark Background), but if it had tried to be that, it wouldn't have been what it is. There you have it; I'm starting to revert to nonsense, as good books have a tendency to make me. Sorry about that. Now go buy this book. Look to Windward is centred on the Culture Orbital Masaq', where most of the story takes place. Quilan (who's a Chelgrian) is send to Masaq' to try to convince his fellow Chelgrian Ziller to return to Chelgrian with him. At least that's what Quilan thinks in the beginning, but there's a lot more on his mind, which even Quilan himself doesn't know about. Most of the story is composed of musing, about the Culture between Ziller and a fellow alien named Kabe, between Kabe and the Core (the AI mind of the Orbital) and between Kabe and Quilan, as they move around the Orbital (Ziller is trying to avoid meeting with Quilan). Even if you aren't as interested in the Culture as I, the story of Quilan will keep you turning those pages. Written on 1st August 2000 by TC.